Greeting! Thanks for stopping by - if you were searching for kappatoo, this is the place to be! If you somehow were not searching for kappatoo, I suppose an introduction is in order. Read on my friend. 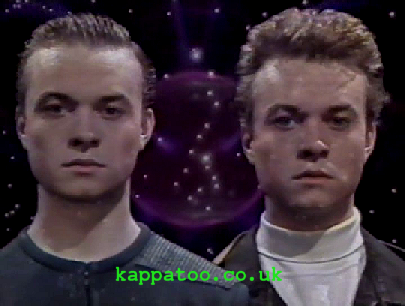 Kappatoo was a sci-fi series shown on Children’s ITV from 1990 – 1992. Only 2 series were made and much of the memory of this show has been cast into the memory hole of time, until now. While we cannot say that this site is brilliant, we can at least say it is the only site dedicated to Kappatoo (that we are aware of) – so you should be thankful, for in the dead of night, when you suddenly have a flashback from your childhood and think “Kappa…..too?” you can come here and confirm that the show was in fact real. Phew. Thanks to Lisa Illowsky and Frederator for the background image.